This weekend Pixelated was updated to version 3.0 adding BBM integration and support for 5 languages. The languages supported by Pixelated now include English, Spanish, Dutch, French, and Portuguese. This update also improves the stability and efficiency of the application. Pixelated is free to download and supports every BlackBerry device released in the last three years including the PlayBook. Pixelated now integrates with BlackBerry Messenger, allowing you to publish your best scores to your BBM personal message, and posting your achievements earned to a Pixelated profile box. You also have the option of inviting your friends to download Pixelated by using the “Share via BBM” button on the About page. Pixelated is an addicting puzzle based strategy game that requires a mixture of skill and luck in order to complete. 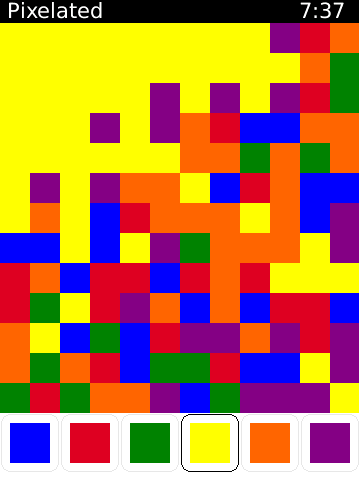 Starting with the square in the upper left corner, the object of the game is to change the colour of the squares until the entire screen is a single solid colour. 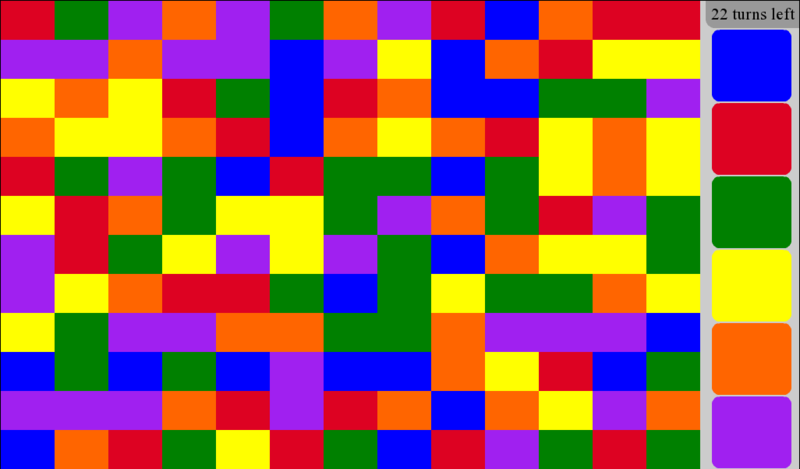 This is done by repeatedly by changing the colour of the blocks in order to match that of the surrounding squares until the entire screen is a single colour. The object of the game is to clear the screen in as few moves as possible.